Wait – in the course of three days pitching great Pedro Martinez is inducted into the Hall of Fame and has his number retired by the Red Sox, and no one runs an ad in the local dailies congratulating him? 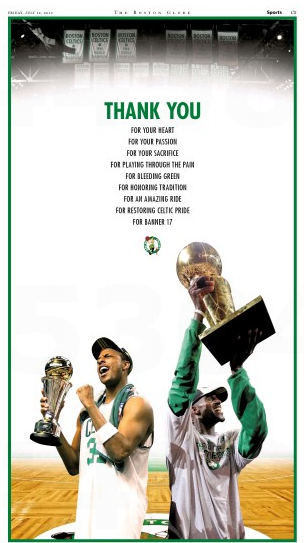 Boston Celtics stalwarts Paul Pierce and Kevin Garnett exited the local scene and they got tribute ads in both Boston dailies. 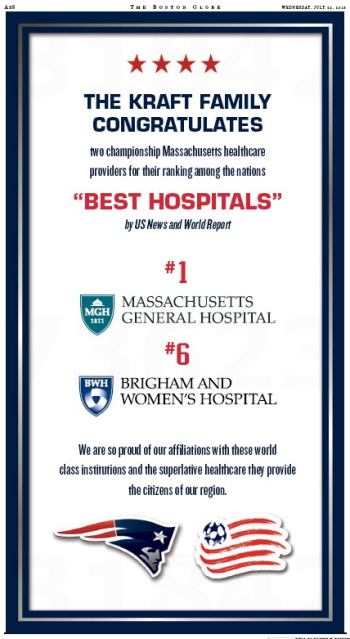 Hell, Mass General tops some tricked-up U.S. News & World Report hospital ranking and it gets a full-page kiss in the stately local broadsheet. But Pedro Martinez joins the ranks of the immortals and . . . nothing? Nothing from the Red Sox? The Globe? The Herald? The New York Mets? The Dominican Republic? Nothing from nobody? This entry was posted on Wednesday, July 29th, 2015 at 12:23 pm and is filed under Uncategorized. You can follow any responses to this entry through the RSS 2.0 feed. You can leave a response, or trackback from your own site.